Find and compare the best prices from a range of well known car rental companies at Corfu International Airport. This is a free to use facility, enabeling you to book direct with the company quoting the price. 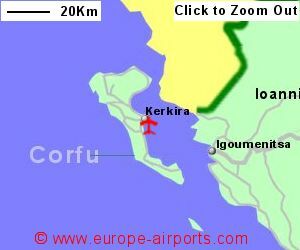 Corfu International Airport, otherwise known as Kerkyra Airport, is located 3Km from Corfu city (Kerkyra), on the east coast of Corfu Island,the most northerly of the Ionian islands, north west Greece. 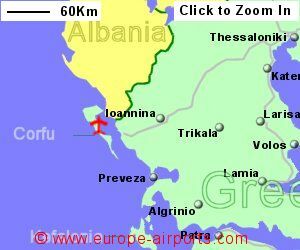 A bus service connects the airport to Corfu town approximately every hour during the day. Taxis are available and the journey from the airport to Corfu city is likely to cost 15 Euros. Facilities include 6 bars/cafes/restaurants, 2 shops, an ATM, a VIP lounge, and FREE WiFi Internet Access. 2.9 million passengers passed through Corfu airport during 2017, an increase of 5% from the the previous year.